XEOMIN® is approved by the US FDA for the treatment of adults with cervical dystonia or blepharospasm and moderate to severe frown lines between the eyebrows. It blocks nerve activity in the muscles, causing a temporary reduction in muscle activity. In addition, it targets frown lines, crow’s feet and forehead wrinkles. 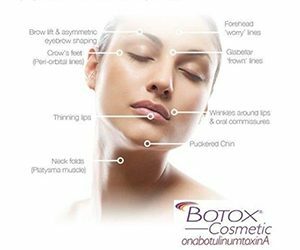 The effects of Xeomin occur within one week, and the results last from three to six months, making it comparable to Botox in terms of both onset and duration of action.